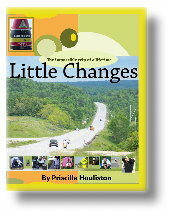 LittleChanges.com The adventure of your life starts here! Buy the book & discover the incredible journey of Priscilla. a website of motivation, madness and making lots of little changes. Always smiling on the outside, always struggling to lose weight and get fit, she has been battling morbid obesity for decades. With a top weight of 440 pounds in May 2006, Priscilla is inviting the world to watch as she takes off almost 300 pounds. The roller coaster ride of losing weight and gaining it back again stops here. Discover that ANYTHING is possible with a few LITTLE changes! Visit this FREE site often, tell your friends, get motivated and make your very own LITTLE changes. Frustrated at being fat, Priscilla Houliston decided to take her health in to her own hands and escape from her prison of weight. This website is a way for the entire world to watch and interact with Priscilla as she dedicates her life to making little changes that will eventually lead her (and you!) to better health. Fat and lazy are two words that are often used together. Priscilla proved that isn't true when she spent over six months bicycling up the east coast of America to lose weight and wake up the world to the fact that if you don't take care of your own health, someone else will have to. What is Priscilla doing now? "After gaining and losing hundreds of pounds over the last few decades, I'm always working on my journey to great health. I'm FED UP with promises of pills, plans and gimmicks that prey on people who are obese. I'll bicycle, swim, hike, walk, stroll, meander, jog (slowly at first), paddle, run (very, very slowly), dance, move and groove my way to fitness! Are you coming with me?" Watch my weight go from 440 pounds to FIT here on LittleChanges!